This corner suite is surrounded on two sides by walls of windows and 3 private balconies overlooking the historic 6th St. as well as the Driskill Hotel. It is right in the heart of vibrant downtown Austin. This stylishly decorated loft comfortably accommodates 1-8 guests in a two-story open floor plan. For less than the price of one hotel room across the street, you can have our whole apartment! SLEEPING: This downtown loft can sleep 1-8 guests. On the entry level, a living area transforms into a sleeping space with two twin size beds located next to a half bath. It features two upstairs sleeping spaces, one with a king size bed, and one with two twins (that could be combined to create a second King) as well as a full bath in an open floor plan. There are 2 twin air mattresses available for additional guests. EATING/LIVING: Use the fully stocked kitchen with stainless steel appliances for meal preparation or walk to some of Austin's best restaurants. Enjoy meals at the dining table that has a beautiful view of the historic Driskill Hotel with seating for up to 8 guests. It's also a great place for meetings if you are in town for business. The open concept first floor living space has a custom sofa, chaise lounge and HDTV with cable. This apartment has stained concrete floors, FREE Wi-Fi and 3 private balconies that overlook downtown. LOCATION: This truly is a 'car optional' property. For guests arriving from the airport, there is a $1.75 shuttle from the airport that drops off at the convention center, only a few blocks away from our loft. Plus 100's of restaurants, shops and other tourist attractions. DOWNTOWN LIVING: This home is right on 6th Street so you have direct access to one of the most popular streets in the 'Live Music Capitol of the World' where there are countless bars and restaurants within walking distance. If you don't feel like going out, many local restaurants, shops and grocery stores deliver to this building, including the flagship Whole Foods Market. This is a great location and a great home for those who want to explore Downtown Austin – you can be a part of it all! While this is a super convenient location, it is definitely not quiet. The bars, restaurants, and music venues do stay open until 2 am or later. If this does not seem like the Top Fit for you, we do have other homes in quieter neighborhoods. PROFESSIONALY MANAGED: By Chereen Fisher and her Top Trip Rentals team, focusing on the Austin Luxury Vacation Rental Home market since 2007. Chereen Fisher has been HomeAway, Inc.’s 'Local Owner Champion' for the Austin and Highland Lakes Area, is a founding member of the Austin Rental Alliance and has owned a local event management and catering company for over a decade. Top Trip Rentals will accommodate your travel needs in a professional and courteous manner to enhance your Austin experience. We have a 24-hour email return policy, numerous staff members on call to assist you, online booking, a welcome packet, flexible check-in hours, and professional cleaning. Chereen Fisher and her Top Trip Rentals team have more than 7 years of experience in the Austin Luxury Vacation Rental Home market. Chereen Fisher has been HomeAway, Inc.’s 'Local Owner Champion' for the Austin and Highland Lakes Area, is a founding member of the Austin Rental Alliance and owned a local event management and catering company for over a decade. Top Trip Rentals will accommodate your travel needs in a professional and courteous manner to enhance your Austin experience. I have lived in Austin since 1979 and seen it grow and develop extensively during that time. After seeing what was out there, I decided there was a need for a home-type setting right in the middle of downtown as a true alternative to the common hotel that could provide a nice, comfortable and affordable way for my guests to really experience Austin! Even after 30 years I can still find something fun and new to do near this location; the location is perfect - you don't even need a car. You can take the elevator down to Austin’s famous 6th Street and start exploring on foot. The Austin Visitor's Center is 1/2 block away if you have any questions during your visit, and we also provide a welcome packet with a few suggestions of our own. There is truly something for all ages to enjoy nearby in this home away from home. This property is very close to the intersection of Congress and 6th street. It's close to the famous 6th street historic district with restaurants and live music venues. Laundry room on same floor. $1.50 per load to wash or dry. Laundry room located on same floor. $1.50 per load to wash or dry. Parking available in the attached parking garage and surface lot across the street for a fee. Parking is available in the attached parking garage and surface lot across the street for a fee. Stayed this past weekend for my bachelor party. Very responsive when needed. Perfect location, loved the two levels. Everyone slept comfortable. Entry to building seemed sercure as well as room. Great experience. Our family stayed here for UT graduation weekend and had a great time. The staff was very helpful and the loft was spacious and clean. The beds were comfy. We enjoyed people watching from the three balconies. Couldn't have asked for a better spot. Perfect loft for anyone looking for a convenient location to go out to bars or even just explore the downtown. We hosted Christmas dinner with my entire family and had a great time, never felt cramped and it was perfect for everyone to find given the location. Plenty of sleep space options to make a perfect unit for special occasions (bachelor/bachelorette party etc). Not the best option for a family with a toddler (windows, wide railings and stairs) but we locked everything and put a baby gate up with no issues. Would definitely recommend to a young family or group that enjoys going out. Littlefield Suite is a Bachelorette Pad! This place is amazing. We felt like celebritiesin this apartment. It's across from the Historic Driskill hotel, in the perfect location, with windows everywhere to people watch all the great 6th street bars and restaurants. Walking distance to all the fun doesnt say enough. We could toss a rock and it would land on the doorstep of our favorite places. The apartment itself is so cool too, the pictures don't lie. we had a goodie basket waiting for us in the kitchen and enough towels to use for a week. And the security, who met us upon arrival to let us in the building, was very friendly and accommodating. Im staying there every time I go to Austin! 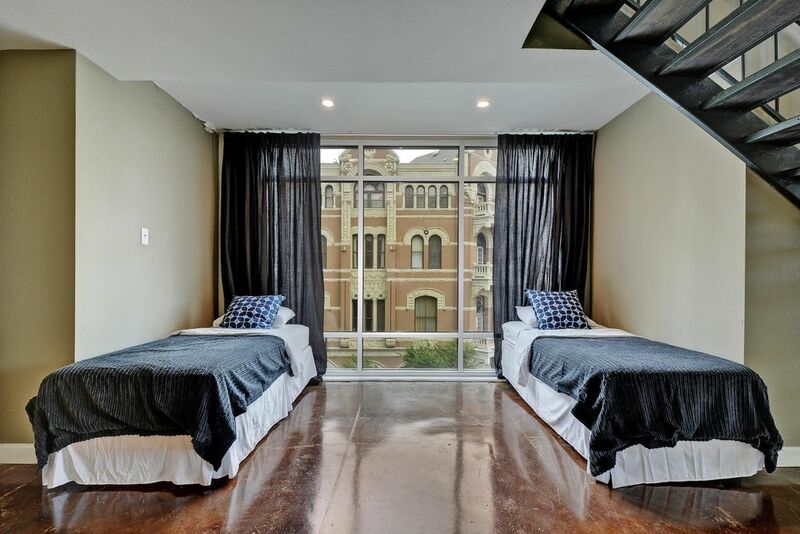 This is a great loft, wonderful views, very well furnished and maintained, and couldn't be better located for those who want to enjoy the buzz of downtown Austin. Everything was perfect, and the management was helpful and accommodating.